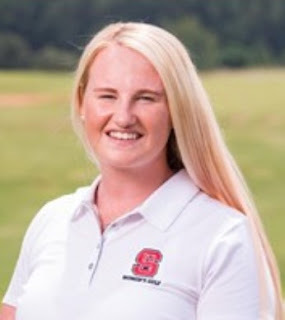 India Clyburn (North Carolina State) and Alice Hewson (Clemson), two English players in contention for the soon-to-be-announced G B and I team to defend the Curtis Cup at Quaker Ridge GC in New York State in early June did not enhance their selection prospects at the Bryan National Collegiate tournament at Bryan Park Champions Course, Browns Summit, North Carolina. Alice Hewson had a nightmare final round of 13-over par 85 after earlier scores of 72 and 75. In her final round Alice had 11 bogeys and a double bogey 6 at the 13th in halves of 41-44. Not a single birdie to lighten the gloom. Hewson finished T47 on 16-over 232. The course was a par 72 over a course of 6,386yd. A third Brit in the field, Scot Jillian Farrell (Charlotte University) from Dumbarton and a daughter of a club pro, finished with a disappointing total of 240, made up of rounds of 77, 76 and 87. Wake Forest (880) won the team title ahead of Furman (895) aidh Auburn and North Carolina joint third on 897. North Carolina State (899) finished sixth and Clemson (915) ninth.